It looms in your mind like a monster from the depths of a childhood nightmare. A stretch of asphalt that twists until the ground drops out from underneath your wheels, snagging you in its negative-G embrace so that it can smother your feeble attempts at fending off its physics-bending topography with the never-quite-quick enough steering and brake inputs that you mount as your only defence. That was the Corkscrew at Laguna Seca as I had seen it through the lens of many a racing video game since my tender teenage years when Gran Turismo first became available on the Playstation. That all-devouring digital maw suddenly looked – and felt – a whole lot different as I approached it in meat space for the very first time, at the top of fourth gear, from behind the wheel of the 2015 Subaru WRX STI. Different how? Let’s just say that my first impression of the Corkscrew as I screamed up the blind hill that leads to its plunging 'left-then-right-then-what?' layout was far less intimidating than I had imagined it would be. Full credit here must be given not to some false bravado adopted as an insulator between my very average skills as a driver and the harsh realities of the real world, but rather to the astounding competence of the new Subaru WRX STI, which has been completely redesigned for 2015. Consider, for example, the WRX STI’s all-wheel drive system featuring an active center differential, which I had set to 'Auto –' in order to direct as much power as possible to the rear wheels. This reduced the steering heaviness that can be associated with all-wheel drive sports sedans, while simultaneously improving the high speed dynamics of the drivetrain and allowing Subaru's fresh torque vectoring system to more seamlessly work its magic. The overall effect was as confidence boosting as it was transparent, with the car’s three differentials (including a Torsen locker aft of the cabin) singing together in perfect harmony with the STI’s chassis and transmitting to me a sweet handling melody untainted by the previous model’s brown note of understeer. 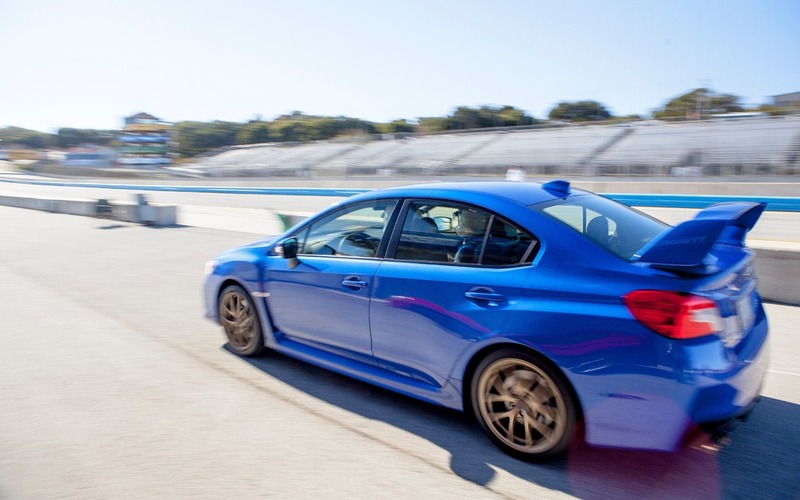 The contribution made by the 2015 Subaru WRX STI’s chassis to the car's willingness to dance across the landscape of a fast, challenging track like Laguna Seca cannot be overstated. Stiffer than ever before, and featuring a revised suspension front and rear along with a dramatic increase in the use of high tensile steel, the sedan’s lack of pitch and roll hardened my own nerves as I crested the Corkscrew’s introductory hill and sawed the wheel to the left in order to plunge down its gullet. The result was…strangely anti-climactic. The WRX STI’s shocks and springs fully absorbed the transition from Earth gravity, to sudden weightless, to addressing the very urgent need to immediately turn to the right. By the time I had sailed the Subaru through the Corkscrew three or four times in succession, I found myself joyfully pushing both the car, and myself, as hard as I could to see just how early I could get back on the throttle and rocket away from its final apex. In fact, I found myself having far more difficulty putting together the other puzzle pieces that are Laguna Seca’s mixed and varied corners. Part of this had to do with the extreme grip and headstrong willingness of the 2015 Subaru WRX STI’s carry-over 2.5-liter turbocharged four-cylinder engine to put the power down as expediently as possible. Take the Andretti hairpin immediately after the start finish line, where I found myself carrying so much speed through the 180-degree bend that I was swept to the very outside of the rumble strips – my own mistake for underestimating just how willing the Subaru’s drivetrain truly was. Corralling 305 horsepower and 290 lb-ft of torque via the sedan’s reinforced six-speed manual transmission erased any longing I might have initially felt for the base WRX’s modernized, direct-injected 2.0-liter unit. The responsive power delivery of the STI’s well-managed power band had me pointing and shooting the car in an attempt to connect Laguna Seca’s bends in the smoothest possible manner. I never once lacked for the surge of acceleration required to disguise the thin spots in my own driving ability. The 2015 Subaru WRX STI certainly doesn’t drive itself, but what it does do is offer the kind of competence and professionalism that elevates the performance of anyone in the driver’s seat. My unforgettable experience at Laguna Seca – topped off by a hot lap with one of Subaru’s long-time engineers and drivers – reminded me of an evening spent with an expert dance partner, one whose ability to lead is matched only by their skill at disguising who’s really calling the steps . The Subaru WRX STI was my Ginger Rogers for a full morning of high intensity, passionate driving at one of the world’s premier tracks. Imagine what the car could do for you. First Drives 2015 Subaru WRX and WRX STI: Should we be Tearing Out Our Hair?